The Phantom takes Christine down into his lair. He takes her down the haunted hallway. A few candles flicker out their last bit of light. Ancient paintings, unwanted masks and a giant organ filled the lair. The organ started playing and the horrid phantom with the mask starts to sing. Christine was terrified. The room was painted black and crimson, making her think of blood. She realized she shouldn’t be here, and she was in danger. The Phantom was no longer her Angel of Music, just a man no one has ever cared for. She realized she was in danger and searched for an escape route. The came across a replica dummy of herself, really giving her the chills. The Phantom mocked her with his wicked laugh. She felt her way through the darkness of the place, desperate to escape free. She ran out to the pond behind the lair, crying for help. As Raoul came to her rescue, she would never forget the scary memory of being trapped in the Phantom’s lair. An old and wrinkled figure opens a secret door in the depths of an abandoned opera house. He has not been here in over 80 years, but he plans on making one last visit. It was here that murders were plotted, kidnappings were committed, and a love was lost. This old and wrinkly man was in the center of it. This man is me. Wooden stairs seem to infinitely extend into the depths below. I walk down them. They creak in protest. Deeper and deeper I go into the hollow cavern that surrounds me. It gets darker and darker. Colder and colder. Slime oozes from the walls. Stalactites hang low. Stalagmites as sharp as knives grow from the ground. They look as if they want to impale some unfortunate passerby. Unlit candles line the walls. Rats scurry. Bats flutter overhead. 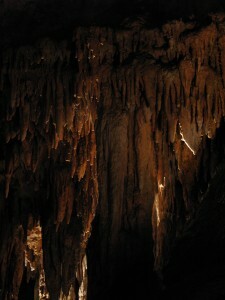 The creaking wooden steps gradually become limestone step embedded in the cave. I continue my decent. It gets darker and darker. Colder and colder. Deeper and deeper. I walk further down. The cruel light that I have known for so long is extinguished. Welcoming dark envelopes me. I walk further down. I reach a hallway. One dull throne is at the end. An organ is next to it. Dust shrouds the organ from view. Cobwebs with spiders run along the corners. I take a seat on the throne. My bony fingers run over intricate carvings on the arm rest. It was expensive for sure. A simple reminder of the wealth I had before I lost everything. Because of Raoul. But now I am back. One last time after 80 years. I will reclaim what was mine and return this cavern to what it was: not a cavern for the bats and rats, but a lair for me. Just as I am about to get off the throne, ominous music begins spreading around the cavern. It fills every corner, nook, and cranny. The organ seems to be playing along with invisible instruments. “There must be invisible instruments,” I think. How else can one explain the sound of violin when it is not visible? I smile. The lair was waiting for me. It was waiting for me to return. Instead of getting off the throne to start fixing the lair, the lair starts repairing itself for me. I relax on my throne and allow the repairing to begin. The dust slides off the organ. The cobwebs disappear. The bats stop fluttering. Rats stop scurrying. Slime stops oozing. The candles light up. The throne I sit on becomes shiny. A dining table appears. A lake is created in the cold and dark depths of my lair. A single boat is floating aimlessly on it. An ornate bed materializes. A Punjab lasso hanged on a hook. The cavern becomes what is used to be: a lair for me. I am the Phantom.